Ghosting is the practice of breaking up with someone without letting them know. It's the act of slowly withdrawing from a relationship, in the hopes that the other person will also feel the same way. It's cowardly, toxic, and ​feels really terrible. Here's what you can do instead. I’ve been ghosted before, it feels terrible. I’d been living in Panama for 6 months. I moved there to start a hostel for motorcycle travelers riding from Central to South America. I was working 12 hour days 7 days a week. I didn't speak Spanish, and I had a hard time meeting women. People said not to worry. They told me everyone speaks English in Panama and the Latinas are going to love me. They were wrong. I was spinning my wheels and getting desperate to meet someone, anyone. No one likes a desperate gringo. I finally met a woman and we went on a few dates. I thought we were getting along but I was probably so starved of attention that I missed all the signs that she wasn't that interested. She started taking longer to reply to texts, and eventually stopped replying all together. That’s why I don’t ghost. I don't want to put anyone through that. 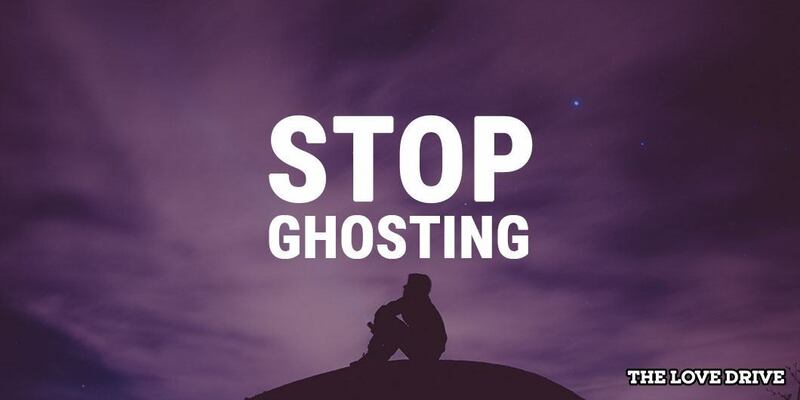 Ghosting is breaking up with someone without telling them. It’s the act of slowly withdrawing from a relationship, no matter how casual, while hoping that the person you’re dating will also slowly withdraw. The person doing the ghosting starts taking longer to reply to texts and phone calls, will cancel a date or two without rescheduling, and generally act aloof and hard to get ahold of. It's cowardly, lame, and a terribly toxic dating practice. Both people feel the same way about each other and don’t mind that the other person is slowly withdrawing. The casual relationship has run it’s course and both are happy to let it die a slow awkward death without having to acknowledge that it’s coming to an end. How convenient. There’s no need to have a potentially difficult conversation explaining that your feelings have changed and that you’re no longer interested in seeing them. Too bad we don’t live in an ideal world. I wish we did. In an ideal world, my hair wouldn’t be thinning, I’d have a lovely wife and two children, and a career I could be proud of. Ghosting is the easy way out. It’s what people do because they’re scared of having a difficult conversation with the person they’re dating about not wanting to date them anymore. Maybe they think the other person will be hurt. Maybe they're right, but they're still avoiding a difficult conversation. I get it, I’m the same way. I'm always scared of having difficult conversations with people. But I still do it because I want to be able to look people in the eye, and I can't do that if I'm not being honest. While riding my motorcycle across South America, I skipped out on paying for a weeks worth of camping. I'm not proud of it but I thought I could pull a fast one. I felt bad about it so when I met travelers who were heading to the campground, I sent them with money to pay for my bill. A week later I ran into the owner of the campground in a city over 500 miles away. He was pissed and said he hadn't received the money I had sent, so I paid him again on the spot. Instead of not paying at all, I ended up paying twice. I don't ever want to have to cross the street because I owe someone something. I'd rather get it all out of the way. That includes having difficult conversation with people I'm dating. I don't know what the future holds. That person I'm thinking of ghosting might end up being my boss one day, or a coworker, or someone that I'll collaborate on a project with. Or maybe they'll turn into a lovely friend and introduce me to the future love of my life. I have no idea how my life will turn out. The universe works in mysterious ways. Watch the video where I interview ghosters and ask them why they did it! When I'm honest it allows the person I'm dating to be honest as well. It’s like being honest about your sexual health. When you’re honest about your sexual health, it allows your partner to be honest about their sexual health. It’s incredibly powerful to be the one to initiate the difficult conversation. It might be hard and it might hurt the person you're dating but they deserve the truth. It's the right thing to do. The faster you rip the bandaid off the sooner the wound can start to heal. I think you’re a lovely person, I’ve had a nice time getting to know you, however the connection we have together isn’t the connection I’m looking for. It's simple, and it doesn't place the blame on you or them. It's no one's fault, and it's OK for you to want a different type of connection. Connection is how two people get along; it’s the relationship that's formed when two people come together. Maybe it's a lack of chemistry, or maybe your pheromones aren't syncing up. Maybe you both want different things out of your relationship, or that you're not as attracted to them as you want to be. There are plenty of reasons why the connection isn't right but it's not helpful to specify. But it is helpful to let them know. Whatever the reason, you owe it to the person you're dating to let them know that you don't want to date them anymore. The easiest way is to tell them the connection you have isn't the connection you're looking for. After you tell them, be quiet. Don’t fill the silence. Let them process what you’ve told them. They might be surprised, they might be sad, or they might feel the exact same way. You won't know unless you do it. Telling them isn't going to be easy, but it’ll be effective and it's the right thing to do. It’s honest, it’s genuine, and it’s tactful. Wouldn't you want the same courtesy and respect? I'm sure you do, you're worth it. We all are.